Yorkshire Wildlife Park, the home of a family of endangered Amur Tigers, have expanded their two-acre land with the additional platforms given by KLE Sign Solutions of Doncaster. 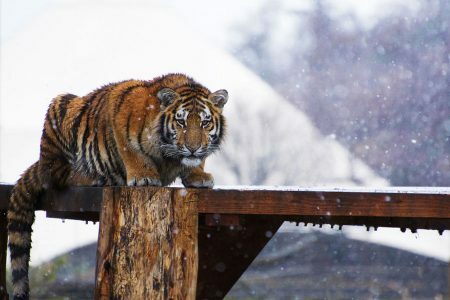 “They are a suitable addition to an already amazing habitat for our Amur Tigers.” Said Simon Marsh, Head of Animal Collections at the park in Branton just outside Doncaster. The Yorkshire Wildlife Park Foundation raises funds for the Amur Leopard and Tiger Allicance, which is contributing in the wild to protect these huge cats from extinction. The Foundation is also funding a rescue and rehabilitation centre for young tigers in their homeland, Russia. Three healthy cubs were born earlier last year as part of a conservation breeding programme by YWP Tigers Vladimir and Tschuna. Gareth Walton, managing director of KLE, said “YWP is a fantastic experience for its visitors and is established on great ethics and the work of committed people” He also said “It is not very often that you get the chance to give something back so we are delighted to help.” YWP, putting lots of conservation at the heart of all its activities, provides visitors a magnificent walk through experience giving unrivalled access to some of the world’s most unique species.